X-files fans across the world, rejoice! 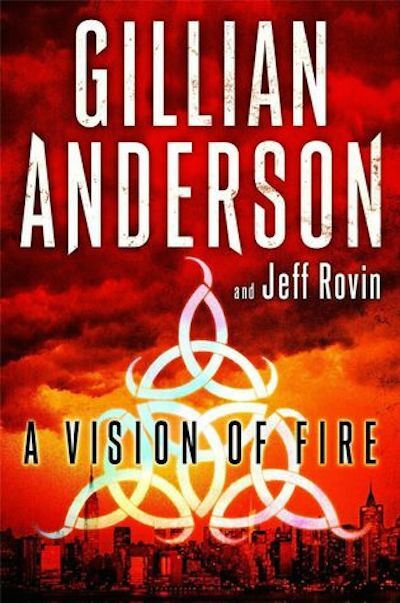 With A Vision of Fire, Gillian Anderson has written a science fiction novel including just the right amount of homage to her eerie investigations as Dana Scully. Co-written with Jeff Rovin, the book is the first novel in what promises to be a supernatural and apocalyptic series called EarthEnd. UN translator Ben contacts child psychiatrist Claire out of desperation–something strange has happened to the Indian ambassador’s daughter. The Indian Ambassador just survived an assassination attempt, and his daughter’s condition is now distracting him from crucial peace talks, as India and Pakistan edge closer to war. Claire, who goes where the trauma takes her, sees the young girl, Maanik, and knows immediately that her bizarre behavior isn’t PTSD. As the world moves towards war, a few young people across the globe seem possessed. Could it be trauma, ghosts, aliens, seizures, past lives? Is there any difference between a traumatic event that I feel or a traumatic event that you feel? And is all this mystical stuff misplaced in a science fiction novel, as there might really be some sort of global conspiracy seeking contact with an alien race? What is really going on here? This is a quick read, as you’ll find yourself skimming frantically through pages, looking for solutions. But brace yourself, as this is only the first book of a series, and the conclusion here is a promise for more answers in the next book.